Most respectfully it is stated that last month establishment has announced the two month salary in bonus for the employees. I have submitted my request to draw the bonus but your clerk has intimated me about the request to be processed as the advance salary encashment. I want this office to make clear the status of my double bonus and why there is a delay in credit of my bonus to the office account. Kindly verify my account number XZTRG032 and make process towards the encashment of my bonus urgently please. On behalf of the reporting team, I request you to award bonus for the entire time since they have worked very hard throughout the year and achieved monthly & annual targets set by the management. My Team has also worked late hours, in night shifts and on Sundays to meet the target without overtime or any extra money & remuneration. Refer to our year 2017 sales target policy I am pleased to inform you that I have sold my sales targets set by the company for year 2017. As per our company sales policy my early target achieving for current year a bonus of amount Rs 5000/= is due at company’s end. So it is humble request to please release my bonus amount and provide me sales target for remaining month of year 2017. 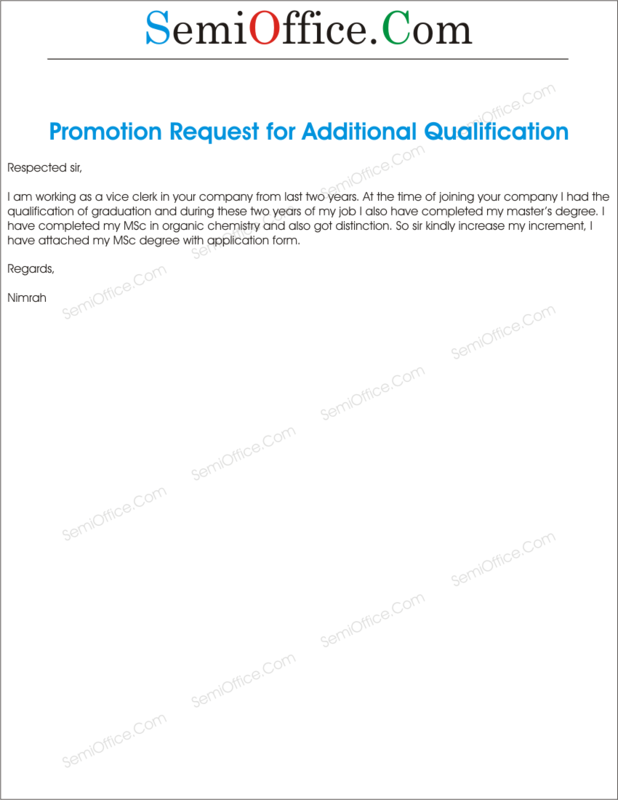 Sample request letter application to ask for promotion and salary increment with increase in pay scale because of additional qualification during the job. Sample application for increment for acquiring higher qualification from company or boss. With all due respect, I hereby write this application to ask for increment in my salary according to my qualification. The salary package is insufficient for my qualification. The company rules state an extra stipend for workers with higher qualifications. I have been working in your company for more than two years now and I still have not received any increment for my experience as well. Along with that I also possess a higher qualification than required for this job. I would like to request an advance increment as per my qualification and experience. An advanced payment shall be a nice incentive for me. I shall be very thankful to you for this favor. I am working as a vice clerk in your company from last two years. At the time of joining your company I had the qualification of graduation and during these two years of my job I also have completed my master’s degree. I have completed my MSc in organic chemistry and also got distinction. So sir kindly increase my increment, I have attached my MSc degree with application form. It is apprised that I am working in this organization for the last 5 years as a Junior Clerk in the Personnel Section. The initial requirement to join this service as Junior Clerk was matriculation along with a diploma of computer typing skills. During my service I continued my studies after obtaining proper no objection certificate from the department and passed my intermediate examination and graduation respectively. I now want to get my qualification documented in my service record after completion usual departmental formalities. Keeping above in view it requested that my departmental documental action may kindly be taken in this regard so that salary increment be granted to me upon obtaining additional qualification. An early action is solicited please. Grant of advance salary increments on acquiring/possessing higher technical qualification. 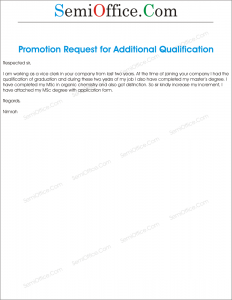 Sample application letter to request salary increment by school teacher to principal. School teacher needs promotions, salary increase with their experience, expertise and skill set they achieved with the time. I plead my request in front of your highness. I was told at the start of my session when I began to teach in this college as a lecturer that was one year ago i.e. August 05, 2017 that if my result will cross 90%, I shall be rewarded with a salary increment by 10% and also be promoted to the “Assistant Professor” post. Sir, all the sections of the college given to me have passed with an accumulative 95%. I hope that you remember your promise. I will be really obliged at your kindness. Hoping for a kind response. It is to state that i, Mrs Rabia Riaz, have been working as JST Junior School Teacher at your school for two years. In this span of time, I have performed up to the mark. I have attatched the evaluation report sheet herewith, to support my application. I request you for an increment in salary as per the performance appraisal system and i assure you that getting increment in salary will increase my performance level. I hope that you will grant my request. I have been teaching in the school from a long time and I am having some financial problems in living comfortably with my current salary. I am living on my own in a rented apartment and with increasing cost of living I am finding my salary not enough to live comfortably. As I am a reputable and well performing the duties assigned to me, I hereby submitting my application for a reasonable increment in the current salary based upon my performance so that I can resolve the current encountered problems. This letter is to request a salary increase. I have been serving as Science teacher since the last few years and only have received the increment in salary two years before. As now the classes has also been increased from four to eighth standard and number of lectures have also been increased from 100 to 150 a month. To carry on my teaching with the same motivation and determination I request an increase in my monthly salary. I know that my application would be taken into consideration. I am fine and I hope you are doing fine too. Been days since we had a cup of tea together! Sir, I am writing this letter to remind you that my annual salary increment has still not been processed. I request you to kindly process my increment as soon as you can. 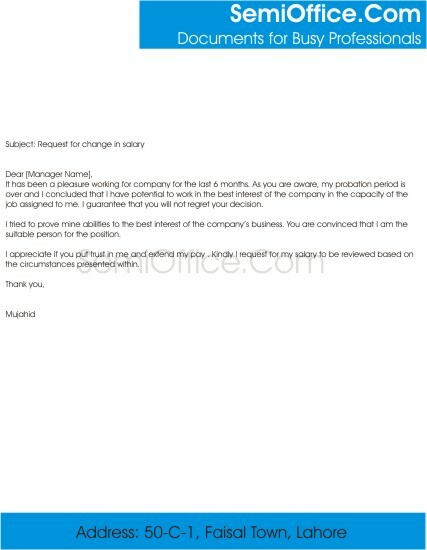 Sample Salary Increment Request Letter to employer, manager, Boss, HR Manager, Admin Manger, Chairman, CEO or director. Requesting increment is not easy but a good request letter can make it easy and simple. So keep remember our website when ever you write any increment letter. It has been a pleasure working for company for the last 6 months. As you are aware, my probation period is over and I concluded that I have potential to work in the best interest of the company in the capacity of the job assigned to me. I guarantee that you will not regret your decision. I tried to prove my abilities to the best interest of the company’s business. You are convinced that I am the suitable person for the position. I appreciate if you put trust in me and extend my pay . Kindly I request for my salary to be reviewed based on the circumstances presented within. It is to be stated that I have been serving this institute since Nov 2015 in the department of computer science. I have worked hard and given the best regarding my performance. On the basis of this two years effort I humbly request for a salary increment. I shall be thankful for this kind favor. Looking forward to your kind concern. Respectfully it is submitted that I am working in Development Wing under your kind control for the last three years. I have also passed the Promotion Exam after which I am eligible for an increment of Rs.1000/- per month as per E&D Rules (Copy attached herewith for ready reference). You are therefore requested to please direct the concerned for processing of my salary Increment Case. I have been working in your company for 3 years as office bearer. Currently I am getting 14,000 per month as my salary. But I am finding it very difficult to manage my household expenditures with this salary. I am living in a rented house, the landlord has also increased the monthly rent of his property. My three children are also studying in a school. I am also facing difficulty to fulfill their schooling expenses. The prices of fuel and daily use commodities have also been increased. The payment of utility bills is becoming another headache. So in such circumstances it has become difficult for me to run my household affairs. That is why I am requesting your honor that my monthly salary should be increased as much as possible. Otherwise it would be very difficult for me to survive on this job. I am Shabbir. I have been working here for three years. This organization has provided me good experience to learn. I am satisfied with the organization and the staff to whom I am working with. Sir, I am currently receiving a monthly income of 60,000 rupees. However, there has not been announced any increment in my salary yet. There is need of time to increase salary after six months considering the hike of dearness in Pakistan. I request you to please increase my salary. I will be thankful for this. Below is the salary revision letter sample available for free download. This letter is to inform your company employees that their annual increments will be revised because of new criteria and policy.You can customize this letter as per your needs. This is to inform all the staff members that the company management decided to revise the salary increments at the end of this month. Management also announced that all the issues raised by the staff members will be addressed in this salary revision. During the revision process if the salary of a staff member will be increased then the company will pay the revised increment from July onward. All staff members can submit their salary revision applications to the HRD department before the 15th of the current month. All staff members also requested to please do not disturb the administration staff regarding revising of salary increments. It is being notified with great pleasure and satisfaction that this firm has reaffirmed its commitment towards providing its employees with best possible salary packages and other perks and privileges for helping them maintain a good life style. Keeping in view the rapid increase in commodity prices and an increasing demand from employee representatives it has been decided by the senior management that salary structure of all grades of employees should be revised. It has been approved that Basic salary of all grades should be increased by 20% along with a 15% increase in overtime rates of all the relevant departments. It has also been decided that a complimentary medical and education insurance will be provided to all the employees and their immediate family members. All the other perks and bonuses remain intact. We hope that these decisions will enhance the motivation level of you all and provide excellent results in the future. What is the Subject in Salary Increment Letter? 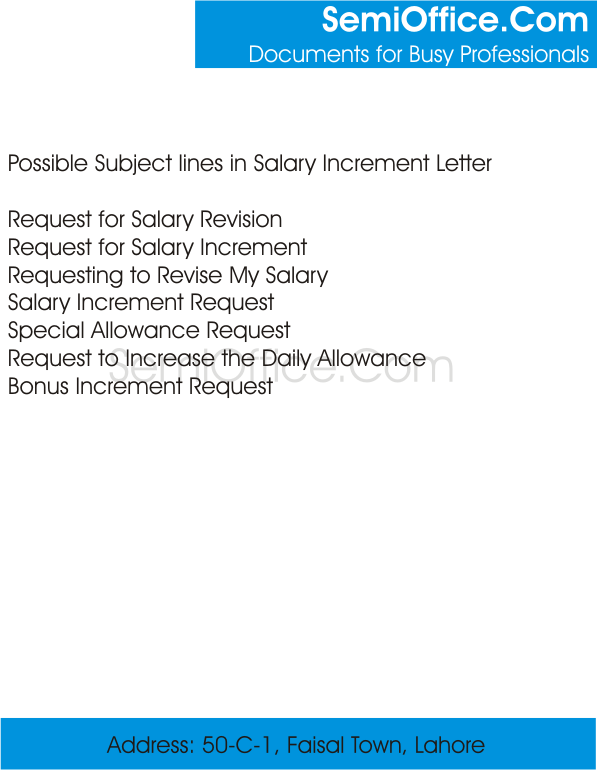 A salary increment letter can be summarized under various subject lines. But one thing you need to keep in mind. Always use simple subject lines and very short and clear letter to request a salary increment. Longer subject lines and lengthy letters can create confusions for the reader. One simple way to request a salary increment is just to write very short subject line and straight forward request in the letter body. Before writing any straight request it would be much better to mention your progress, achievements, job duration, your commitment to the job and your interpersonal skills, education and qualities. But you must be specific and write a concise request. Don’t be specific on the above given subject lines you can use your own or create your own subject line according to your needs. Author Sami UllahPosted on December 4, 2012 May 10, 2017 Categories Salary Increments and Benefits, Salary LettersTags Increment Letter, Letter, Salary Increment1 Comment on What is the Subject in Salary Increment Letter?